In the heart of the Western Pacific Ocean, a trio of destinations deliver some of the most storied dives on the planet. Yap's international claim to fame are the giant manta rays that appear within near clockwork precision, often joined by grey, black and white tip reef sharks. The floor of Chuuk Lagoon is strewn with a Japanese fleet now covered in thick growths of coral, with dim interiors holding relics of a time past. Palau delivers a smorgasbord of underwater adventures, from the swirling sea life drawn by the currents at Blue Corner to the shadowed chambers of Chandelier Cave and the unique freshwater residents of Jellyfish Lake. The archipelagos of Yap, Palau and Chuuk are surrounded by extensive barrier reefs that create large lagoons. All diving is by boat, with some sites minutes from the dock, and others more than an hour away. 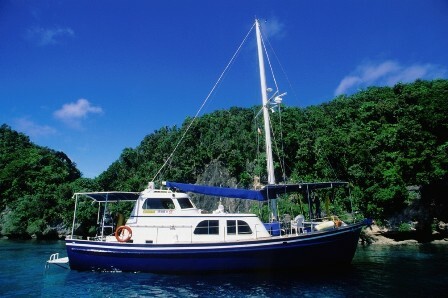 Chuuk and Palau are also served by liveaboards. Though each destination has a signature attraction—wrecks, reefs or mantas—all three destinations offer a full range of underwater adventures, some suitable for all divers, others requiring a sense of adventure. Both fish life and coral cover are excellent, and underwater clarity outside the reef can be astounding. Water temperatures range from 82 to 86 degrees year-round. Currents and fish life often go together at many prime dive sites. In addition to the usual preparations such as carrying a surface marker buoy in case of separation from the group, divers can prepare for moving water by streamlining their equipment, routing hoses close to the body and removing or stowing dangling objects in pockets. If diving wrecks, first brush up on buoyancy skills and non-silting fin kicks. Though waters are bathing suit warm, a skin suit will aid streamlining and provide exposure protection from reefs and wreck surfaces. Nitrox will provide additional bottom time for many of the wrecks of Chuuk. The waters of Chuuk Lagoon are famous for Japanese war wrecks such as the Fujikawa Maru and Shinkoku Maru, but Palau also has a ghost fleet, including the Amatsu Maru, which is the largest shipwreck in Micronesia. Schooling fish and sharks gather at current-washed sites such as Blue Corner, and the Big Dropoff is considered one of the finest walls dives in the world. Stalagmites decorate the submerged chambers of Chandelier Cave, and endemic jellyfish create a curtain of life in their namesake lake. Yap’s Valley of the Rays offers year-round opportunities to dive with giant manta rays, while sites like Yap Caverns provide chances to explore intricate cuts and chimneys carved into the reef face. A full-body skin suit for sun and environmental protection. Light for examining wrecks or diving Chandelier Cave. A reef hook for current-washed points such as Blue Corner. Lightweight casual clothing when ashore, and sun protection for long boat rides. LIVEABOARD - 20% OFF TRUK LAGOON ITINERARY includes 7 nights twin/double cabin accommodations, up to 4 dives per day, free Nitrox, complimentary use of dive gear, breakfast, lunch and dinner daily, snacks and beverages including local beer, and roundtrip airport transfers. Valid for departure on 10/20/19. Book by 5/5/19. PALAU - EARLY BOOKING SPECIAL includes 7 nights Garden View accommodations, 5 days of 2-tank boat dives, free Nitrox, breakfast buffet daily, lunch and drinks on dive days, complimentary beverage package of beer, soda and water, complimentary late night coffee, tea, juice and pastries, free WiFi, roundtrip airport transfers, hotel tax and service charges. Valid 4/1/19-4/26/19, 5/7/19-6/30/19 & 10/7/19-12/20/19. Book by 6/30/19. 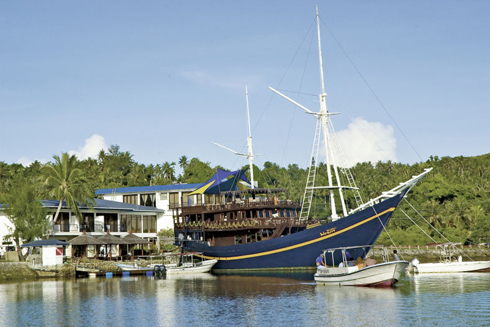 LIVEABOARD - 7-NIGHT TRUK LAGOON ITINERARY includes 7 nights twin/double cabin accommodations, up to 4 dives per day, free Nitrox, complimentary use of dive gear, breakfast, lunch and dinner daily, snacks and beverages including local beer, and roundtrip airport transfers. LIVEABOARD - 7-NIGHT ITINERARY includes 7 nights twin/double cabin accommodations, up to 5 dives per day, free Nitrox, breakfast, lunch and dinner daily, snack and beverages including beer and wine, rountrip airport transfers, dive permit fee and cabin tax. LIVEABOARD - 7 NIGHT ITINERARY 7 nights twin/double cabin accommodations, up to 5 dives per day, all meals, snack, tea, coffee, water and milk, rountrip airport transfers, and cabin tax. 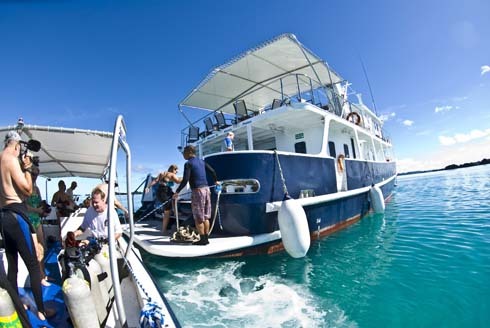 *Price does not include Dive Permit or Palau departure taxes. PALAU - SAM'S TOURS DIVE PACKAGE includes 7 nights Garden View accommodations, 5 days of 2-tank boat dives, complimentary 3rd tank dive at Chandelier Cave, Jellyfish Lake snorkeling after one of the 2-tank dive days, unlimited diving at Sam’s Macro Wall, free Nitrox, breakfast buffet daily, complimentary beverage package of beer, soda and water, free WiFi, roundtrip airport transfers, hotel tax and service charges. PALAU - SAM'S TOURS DIVE PACKAGE includes 7 nights Superior Garden View accomodations, 5 days of 2-tank boat diving with Sam's Tours, complimentary 3rd tank dive at Chandelier Cave, 3rd tank dive in wreck, unlimited diving at Sam’s Macro Wall, free Nitrox, roundtrip airport transfers, hotel tax and service charges. Optional tours available to add on include scenic helicopter, sea kayaking, snorkeling, hiking, cultural and historical tours of Palau, the Rock Islands and more. 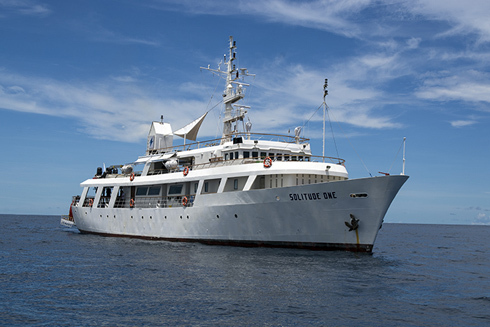 LIVEABOARD - 7-NIGHT ITINERARY includes double cabin accommodations aboard the Solitude One, up to 4 dives per day, all meals and snacks, complimentary Rock Island, roundtrip airport transfers and room taxes. Does not include Rock Island permit ($100), Peleliu permit ($30) or departure tax ($50). YAP - DIVE PACKAGE includes 7 nights accommodations, 5 days of 2-tank boat dives, daily breakfast, roundtrip airport transfers, hotel tax, and service charges. 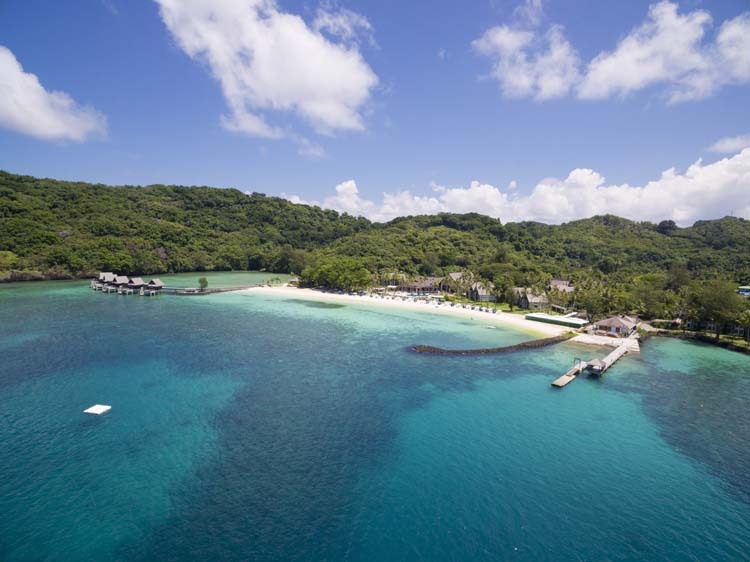 YAP - Manta Ray Bay Resort offers 35 luxury hotel rooms, dive shop, watersports and land tours, digital photo center, a European-style micro brewery, and a spa and infinity pool. 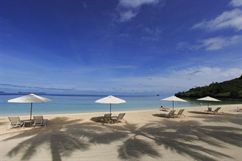 PALAU - Experience the Palau Pacific Resort - the only luxury resort in Palau featuring 160 deluxe rooms and world-class amenities on a private 1,000-foot stretch of pristine white sand beach. Amenities include two restaurants, a beachside bar, pool and jacuzzi, shops, activity center, tennis courts and spa. Lush landscaping including a fishpond with exotic marine life provides a tropical setting for relaxation and exploration. PALAU - Experience some of the world's best diving in Palau while staying at the Palau Royal Resort, located just minutes from the main city of Koror. When you're not diving, you can relax in the spa, by the pool, or on the private beach with amazing sunsets and views of the Rock Islands. TRUK - This verdant, 14-acre oasis with breathtaking views of Truk Lagoon features 54 rooms that are comfortably furnished with a TV, phone and private balcony. The restaurant offers a wonderful view of the resort grounds and lagoon. 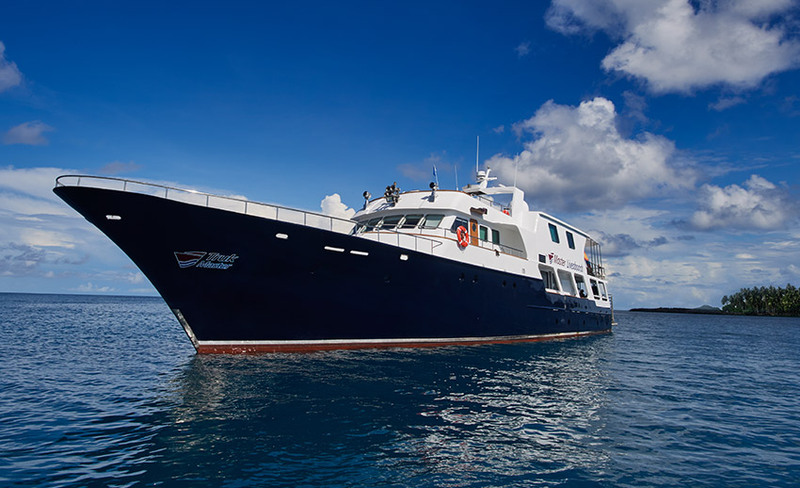 PALAU - This exclusive live-aboard has three twin cabins, each with ensuite bath and air-conditioning for a maximum of six divers, which means uncrowded reefs, ease of entry into the water and personal attention. The vessel is designed for avid divers and professional underwater photographers with a big working area and more than 60 electrical outlets (110v and 220v) and extra storage space. 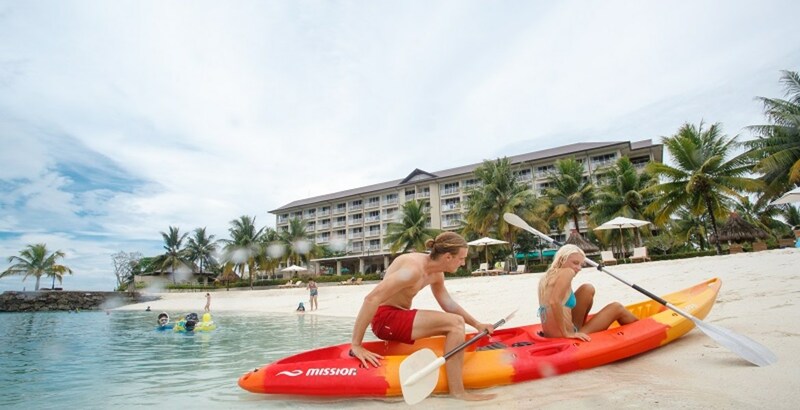 Click below for 7-night departures including all meals and diving. Contact us for information on 10-night departures. Diving permits, government fees and Nitrox are additional. PALAU - 7 and 10-night itineraries offer diving through the islands of Palau in air-conditioned, ensuite cabins, and include all meals, free beer, free Nitrox and dive equipment. Click below for available 7-night departures through 2018. These trips sell out quickly so call for current availability and information on 10-night departures (not available online).Port taxes, marine park fees or liveaboard fuel surcharges are additional. LIVEABOARD - The luxurious Ocean Hunter III offers 3 standard cabins, 3 deluxe cabins and 2 master staterooms, all with private bath and air-conditioning accommodating up to 16 guests. The Ocean Hunter III was designed by divers, for divers. There is a large dining room and a comfortable salon with sofas and and entertainment system. 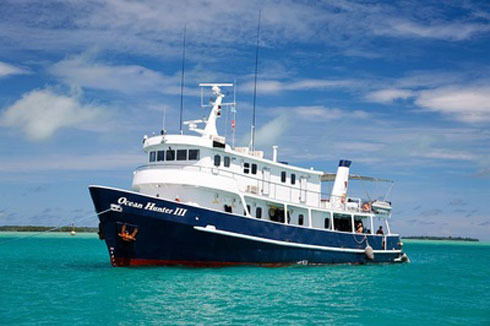 Ocean Hunter III offers the very latest of high quality liveaboard experiences. 7 and 10-night itineraries available. 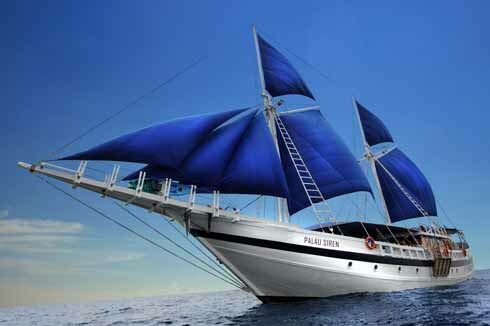 LIVEABOARD - The Palau Aggressor II explores the waters in and around Palau including the famous Blue Corner. This spacious, comfortable catamaran was specifically built for diving and stretches 106 feet long, 31 feet wide and accommodates 18 guests who are pampered by a crew of six. Enjoy the thrill of drift diving with schooling sharks, the beauty of healthy hard and soft corals, the tranquility of Jellyfish Lake, the historic WWII wrecks and the vibrant fish life that all make up the diving in this grand place. 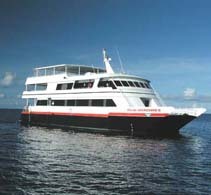 Diving will be conducted from a dedicated 18-passenger tender. 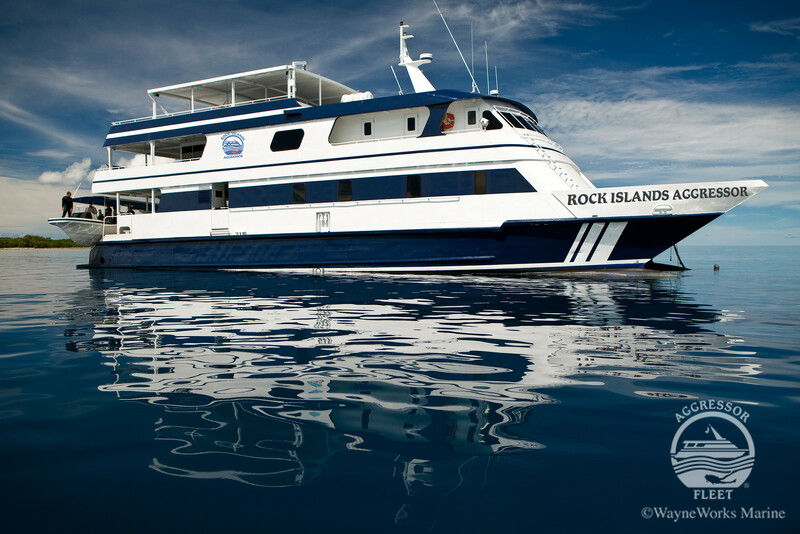 LIVEABOARD - Rock Islands Aggressor (formerly the Tropic Dancer) offers 7 and 10-night itineraries exploring the sites in and around Palau, including the famous Blue Corner. This spacious 106-foot catamaran was custom built for diving and accommodates 18 divers and a crew of six. Enjoy the thrill of drift diving with schooling sharks, the beauty of healthy hard and soft corals, the tranquility of Jellyfish Lake, the historic WWII wrecks and the vibrant fish life that all make up the diving in this epic dive destination. 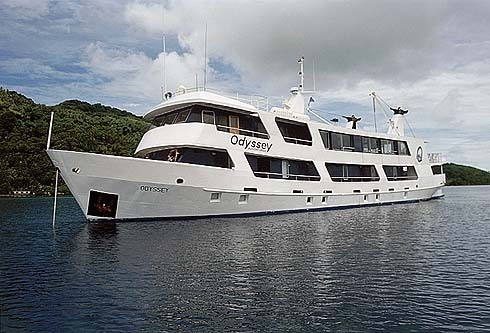 LIVEABOARD - Dive with Odyssey Adventures to see the Ghost Fleet of Truk Lagoon. The 132’ Odyssey has nine ensuite staterooms. 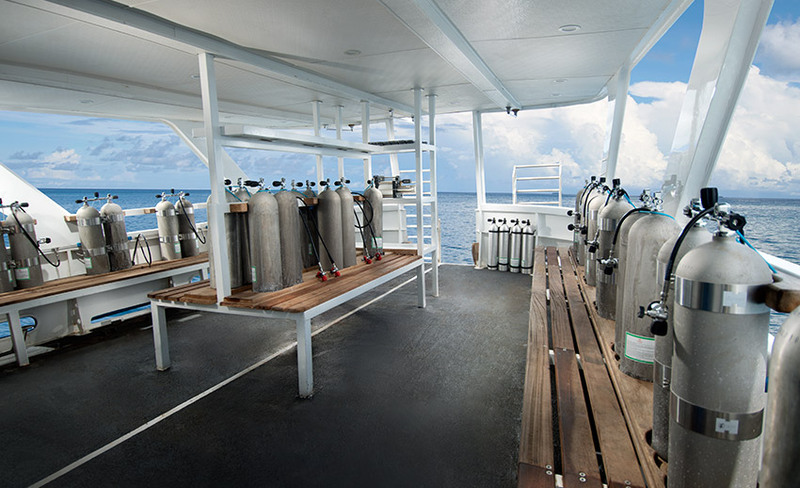 Diving is directly from Odyssey and the dive deck includes a large, dry, multi-tiered camera table, personal gear locker for each diver, large rinse tanks for photo and dive gear, and a freshwater shower. Nitrox is free onboard the Odyssey. TRUK - Dive Truk Lagoon by luxury liveaboard and experience diving some of the world’s top rated wreck dive sites in comfort and ease. The Truk Master is a 37-meter (120') steel-hulled motor yacht which will be commencing operations in Truk in February 2016. The liveaboard will accommodate 16 divers in eight air-conditioned ensuite cabins. Nitrox and rebreather support are available (additional cost). Click below for available 7-night departures through 2018. 10-night departures also available. These trips sell out quickly so call for current availability and information on 10-night departures (not available online). Micronesia is more water than land, with some 2,100 small islands spread over three million square miles of the Western Pacific. 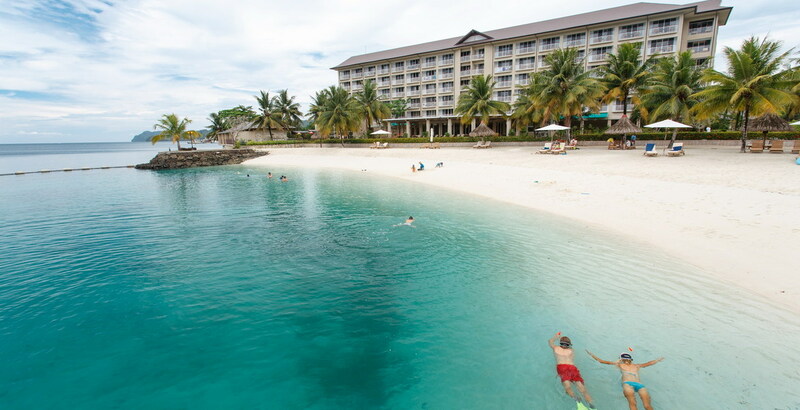 This region is home to some of the healthiest coral reefs and clearest waters in the world. It was also a hotbed of fighting in World War II, and the pitched battles between US and Japanese forces that took place around the islands of Palau and Chuuk now present divers with a wealth of wreck diving opportunities. Each destination in the region offers its own mix of diving adventures. Palau is a collection of small islands grouped atop an uplifted limestone plateau at the biodiverse intersection of the Pacific Ocean and the Philippine Sea. The surrounding reefs support more than 1,200 species of fish and some 800 types of corals and sponges. The currents that wash channels and exposed ridges such as Blue Corner and German Drop-off draw sharks, groupers, rays, turtles, tuna and Napoleon wrasse, providing divers with a thrilling show as they hang on reef hooks to hold stationary against the flow. The lagoon holds a number of war wrecks, plus shallow reefs where currents are never a problem. Palau is famous are the submerged chambers of Chandelier Cave, which is decorated with stalagmites from an era when sea levels were lower. Equally well known is Jellyfish Lake, where non-stinging jellyfish have evolved to live in a marine pond, providing snorkelers with a rare chance to immerse themselves in a gelatinous cloud of life. Palau is also home to the famous Rock Islands. Some 200 of these unique limestone formations are found in the shallows west of Koror. Centuries of tidal erosion and grazing sea creatures have worn away the base of these structures to give them the appearance of giant mushrooms rising from the sea. Yap is known worldwide as a destination where interactions with manta rays are almost guaranteed. Located below the Pacific's Typhoon Belt, this coral-ringed island is washed by plankton-rich upwellings that support a resident population of mantas. These graceful members of the shark family gather at cleaning stations. The sites where mantas are most prominent are the cleaning stations of Mi'il Channel, which is located on the northwestern side of Yap, and Goofnuw to the northeastern side. As many as 40 individual mantas have been counted at each of these sites, and encounters happen with year-round regularly. Yap is not a one-hit wonder, however, as more than 30 additional dive sites around the island offer walls, drift dives and frequent encounters with gray, black and white-tip reef sharks on fringing reefs. Other sites offer caverns and canyons covered in large gorgonian and fan corals, and patrolled by varieties of reef fish, eagle rays and schools of tuna and jacks. Chuuk provides the Pacific's most extensive collection of war wrecks. More than 100 Japanese ships and aircraft lie on the bottom, the victims of concerted bombing raids by US forces. Encrusting corals now cover superstructures in a colorful living blanket in hues from pink and purple to yellow and red, while shadowed cargo holds are still filled with munitions, tanks, motorcycles and other war ordinance. Lagoon waters are warm and generally current-free. Many dive profiles fall within the 80 to 100 foot depth range, with superstructures on favorite wrecks such as the popular Fujikawa Maru rise to depths of less than 30 feet. Other wrecks reach the limits of recreational diving and beyond, allowing those with appropriate experience and training to perform penetration and staged decompression dives. Chuuk's most popular wrecks can be accessed by land-based operations, while several liveaboards also cruise the lagoon. Though wreck diving continues to take center stage at Chuuk, there are miles of rarely visited reefs, and operators offer trips to sites such as Shark Island, where gray reefs and other species gather at cleaning stations. A valid passport is required for entry which must be valid for 6 months beyond your date of entry. The passport should have one blank page for entry stamp. No visa is required for stays less than 30 days. Proof of onward or return ticket may be required. Palau has a $50 departure tax and Green Fee, Yap, Pohnpei and Truk have a $20 departure tax and Kosrae has a $15 departure tax, all of which are not included and must be paid in the destination. Check Micronesia's entry and exit requirements here. Thre are no vaccines required for entering Micronesia, but you should always check with your doctor the Centers for Disease Control on recommended vaccinations for travel here. The group of more than 2,100 islands known collectively as Micronesia cover an expanse of the Pacific Ocean the size of the United States but have a combined landmass less than the state of Rhode Island. The region's ethnicity and culture is a mixture of Melanesians, Polynesians, and Filipinos. Due to their historic isolation from each other and the wider world, each island group developed unique traditions and beliefs. Colonial influences and the advent of jet-age tourism have brought metropolitan centers into the 21st century, while more remote out islands still hold to many of the old ways. Yap, in particular, is a land where daily life is centered around villages where the local chiefs conduct community affairs from the men's longhouse. Positioned outside many of these houses are giant stone wheels that represent one of the island's most interesting traditions. While the US dollar is now the official currency of Yap, hand-carved circular stones of up to 12 feet in diameter are still used as the local legal tender for the payment of dowry or the purchase of land. Fishing has long been an important staple of life on Palau and Chuuk. The traditions of craftsmanship once used to hand-build boats and weave palm-fiber clothing are also expressed in such as intricate wood carvings and decorative accessories fashioned from sea shells and ivory nuts. Reminders of the conflicts of World War II are found across the islands, with bunkers, gun placements and fortified caves now overgrown by the jungle, and every manner of discarded or lost war materiel from rifles to tanks lying hidden below the water. Electricity in Palau, Truk & Yap is 110 Volts, 60 cycles. If you travel with a device that does not accept 110 Volts at 60 Hertz, you will need a voltage converter. Micronesia has a modern reliable telecommunication system. WiFi is available at many hotels. It is recommended that you check with your cell phone provider to see what international plans are available for voice, data and texting. It is recommended by the CDC to not drink the tap water in Micronesia. Bottled water or purified water if supplied by the resort are best. There are four indigenous languages in Yap: Yapese, Ulithian, Woleaian and Satawalese. English is the official language of the Federated States of Micronesia (FSM) and is commonly spoken and understood. Many elderly Yapese are fluent in Japanese. The official currency in Yap is the US Dollar. Yap is famous for its Stone Money which is still in use for traditional exchanges such as the purchase of land or in village ceremonies. There are two commercial banks in Yap, the Bank of the FSM and the Bank of Hawaii. U.S. currency is used. Major credit cards are accepted by most hotels, traveler's checks are recommended for purchases at restaurants and for shopping. The official language of Palau is English and Palauan. Currency is the US Dollar (USD). There are banks in all the major tourist areas, where credit cards are widely accepted, at visitor-oriented businesses. The official language of Truk is English, but Chuukese is also spoken. The official currency is the U.S. Dollar (USD). There is a branch of The Bank of FSM located in Truk, although the hotel will be able to accept your major credit cards. Micronesia follows the American custom and tipping is an accepted practice in restaurants, hotels, baggage handling. The Federated States of Micronesia and Palau to not observe Daylight Savings Time. Yap and Truk/Chuuk are 10 hours ahead of Greenwich Mean Time (+10 GMT). Pohnpei and Kosrae are 11 hours ahead of Greenwich Mean Time (+11 GMT). Palau is 9 hours ahead of Greenwich Mean Time (+9 GMT). The Federated States of Micronesia which includes Yap, Truk, Kosrae and Pohnpei are located in the western pacific approximately 2,500 miles southwest of Hawaii, 450 miles southwest of Guam and 360 miles northeast of Palau. The Republic of Palau is an archipelago of over 500 islands in the western Pacific Ocean, the size of roughly 460 square miles. Palau is part of the Micronesia region. 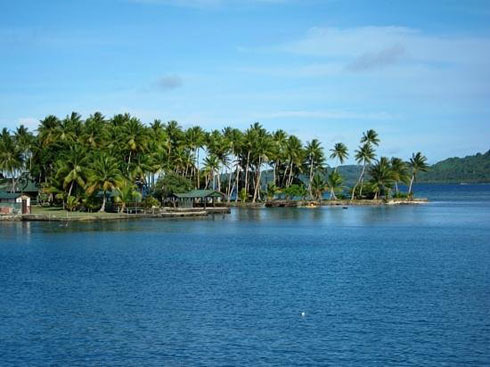 The most populated islands are Koror, Angaur, Peleliu and Babeldaob, the capital. About 2/3 of the population of Palau live on the island of Koror. The population of Micronesia is 104,966 (2016), with 21,501 in Palau, 11,377 in Yap, and an estimated 53,000 in Truk.